On February 2, 1864, Union Maj. Francis M. Davidson and the 14th Illinois Cavalry engaged in a skirmish with Thomas’s Legion, a Confederate company of Cherokees led by Col. William Holland Thomas, on Deep Creek near Quallatown in Haywood County. Accounts differ as to what exactly occurred that morning, but Union forces apparently surprised the Confederates and overran them. On the Union side, two men were killed and another six were wounded, while Thomas most likely lost 10 killed and 32 captured. Eighteen Confederate Cherokees were taken prisoner. The captives were imprisoned in Knoxville, then Union control, where all of the Cherokees took the oath of allegiance to the United States in early March. The event was a turning point in Cherokee allegiance to the Confederacy. 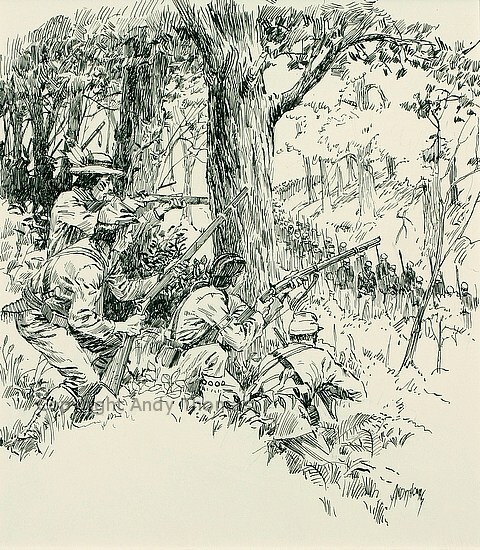 The affair at Deep Creek undermined Thomas’s recruiting efforts among the Cherokees. The event coincided with internal conflicts, skyrocketing food prices due to inflation, a harsh winter and an increase in starvation among Indian families. Thomas attempted to assuage the food shortages by purchasing grain from South Carolina, but the raids into western North Carolina, such as that at Deep Creek, led to the desertion of the Eastern Band from the Confederate cause.